This topic contains 28 replies, has 6 voices, and was last updated by JamesIII 3 years, 10 months ago. Explore the garden of the ninja and find a way inside the giant ninja. The giant ninja is vulnerable in three places: the head, the tip of his blade, and his armpit. Try not destroying any of the walls or fences for added “fun”. Thanks to cyberhelix and arobsite for their videos. Most of all, thanks to Vaughn for such an awesome game! Explore the Mushroom Castle by following the path. Locate the four giants: The survivor, The Knight, The Dolphin, and The Sea Dragon. Danger is nearby, a battle you surely cannot win lies to the south. Quickly grab the fire wood and light your torch. Enter the tomb of the skeleton king and find his throne room to end his madness. Once you’ve killed the king, either go back to where the save started and head south towards the underground spring or jump into the water from the western exit of the tomb. An epic battle awaits you at the entrance and a secret vortex exists south of the tiny boat next to the tomb. Don’t get surrounded by pirate ghosts, it never ends well. Escape the Goblin Brothers’ boat alive. Follow the treasure map you find onboard the ship. Discover the secret stash and leave using the dock heading south. Follow the clues across the sea to reach the main island traveling from dock to dock. Reach your house located to the south once you reach the main island dock. Find a way inside the castle walls to the west without using a door or cave entrance. Reach the inner sanctum of the castles treasure room to claim victory. Welcome to WIK17. This version takes us back to the beginning and with limited items. 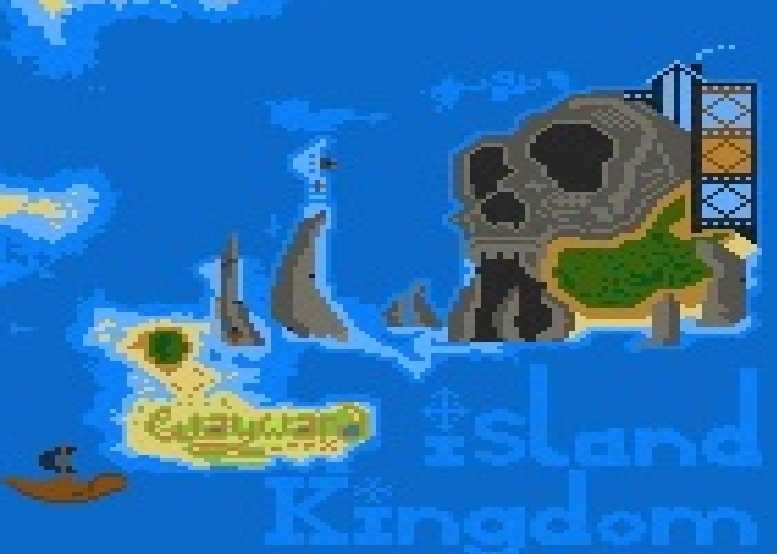 The point of this version is to create the beginning island which will familiarize players with the basics of wayward to ensure survival in this harsh wayward island kingdom. You will be given a set of primary objectives that must be completed before moving past the great turtle. You are asked to refrain from removing any walls or fences to reach areas. No swimming is allowed but you are allowed to use rafts you find. Maps have been placed to help you find your way to important areas. The game is still a series of random ideas so if at any point you want to deviate from the path, feel free too. Good luck and have fun! Turtle Cleaning Tools: Locate 3 exceptional stone arrowheads. Archaeologist: Locate a remarkable fossil. Bad Deed: Kill the Living Rock hidden near the small oasis. Good Deed: Clear away all the brambles on the giant sea turtle. Welcome to version 16 of WIK. You play as the wayward alchemist who is in a search to collect all of his alchemical equipment. Once your Alchemy skill reaches 120% and you have collected enough gold you may exit using the bullboat located somewhere along the great bridge. Welcome to the next installment of Wayward Island Kingdom. This release will showcase some simple gathering quests and has a few rules to make things interesting. You are asked not to venture past shallow water until you locate the raft and gold. Destroy sandstone rock to follow the intended path and find treasure on the wayward island. You should be able to collect all items and reach the end of this game without any crafting. The quests are broken into Primary and Bonus Categories. Only the Primary quests must be completed before you may use the raft. Pat yourself on the back if you can complete all of the bonus quests as well. 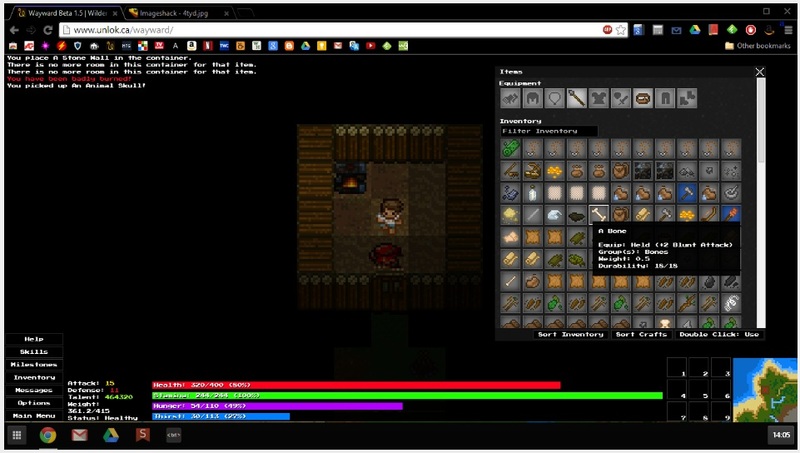 The same items can be used in multiple quest counts. Basic Tools: Locate the bow, the stone axe, the stone shovel, and the stone hammer. Suit Up: Locate gloves, a helm, a gorget, a chest, a belt, leggings, boots, a shield, and a boat paddle. Amber Hunt: Locate 6 pieces of amber. The Lesson: Locate 10 instructional scrolls. Stone Cold Killer: Locate 7 stone knifes(no cheating). The Dueces: Locate 2 stone hammers, 2 corded slings, 2 iron ore, 2 limestone, and 2 talc. Scavenger Hunt: Locate the thistle seeds, a rope, a sundial, some sharp glass, a red mushroom, and some cotton fabric. Once you complete all quests, raft to the boat with black sails and claim your prizes. For a final quest, locate all 5 treasures on the maps from the boat. Welcome to the pineapple game! Contestants are invited to grab as many pineapples as they can, jump on the raft, and head just a weee bit north. Along the coast you might notice some critters, you might even feel the urge to throw a pineapple at these critters. If you can clear the whole beach, there’s even a boss save with an aberrant time skitter. Can you defeat all the critters before the pineapples run out? A small demonstration of the cartographer mini class has been prepared in the boat across the bay. Follow provided treasure maps to get an idea of how this class will work. Starts at base camp with minimal items and a treasure map leading north. Once you reach the house shown on the first map, a second map will be found inside leading to your house. From your house depart north from the dock to reach the first dungeon. Recover the golden chalice without breaking any walls or fences and locate the treasure map leading to Gumanji. If you get lost, just play it as sandbox mode or try restarting the save file. Starts at alter to Gumanji and all items given. Very easy version to showcase Gumanji mod. This topic was modified 5 years, 4 months ago by JamesIII. This topic was modified 5 years, 2 months ago by JamesIII. This topic was modified 5 years, 1 month ago by JamesIII. This topic was modified 5 years ago by JamesIII. This topic was modified 4 years, 10 months ago by JamesIII. This topic was modified 4 years, 9 months ago by JamesIII. This topic was modified 4 years, 8 months ago by JamesIII. This topic was modified 4 years, 7 months ago by JamesIII. This topic was modified 4 years, 6 months ago by JamesIII. This topic was modified 4 years, 5 months ago by JamesIII. This topic was modified 4 years, 4 months ago by JamesIII. This topic was modified 4 years, 3 months ago by JamesIII. This topic was modified 4 years, 2 months ago by JamesIII. This topic was modified 3 years, 10 months ago by JamesIII. I made you a moderator on the forums you can keep this and your other thread updated if you want. Thank you for making me a moderator and trying out the map! I tried that monster party mod and it will definitely be useful for adding something extra to the dungeon areas. Is there any way to create a specific monster spawning only? The other two ideas I thought would be cool were a monster editor so I could make a stronger version of certain monsters for a sort of boss fight feel and some sort of cave entrance creator for when there is not dirt below in the adjacent cave system. By the way…there seems to be a way to get infinite walls and dirt. Also, duplicating items with the save/load mod. I’m still not sure exactly what actions are triggering the swap but I’ll keep you posted. Ok thanks for the modding tips, I’m going to see what I can do. Have you had a chance to look around in the map yourself yet Vaughn? Yep, I’ve played around a bit for sure. It’s quite insane, haha! My little cabin from the mini game. It even has a bear skin rug. Well, a bloody bear skin rug. Hey, how to play on this map? i download .json file but dont open with mods? say “an error ocurred”. how to play??? Are you loading it using the current saveload mod? Any chance to put it on another site? Every time I try from that site from both the new part and the old one I can’t get it. Keeps giving me some server error. Do you have any tracking available for how many downloads it’s got? If not, perhaps I can host it on the Modifications page and track it that way. Shrine to Gumnangi added. This mod is so cool! Hello James, you seem to be linking to an image with your latest download instead of the save. Wayward Island Kingdom 15: Thalassophobia release. Try escaping the new chain of islands without venturing past shallow water. No worries, there is a path to a raft and a way off this wayward island. All links should be current for the listed versions they work on. Please report any mistakes or bad links please.